After planning for last year’s Arcadia 10th anniversary event to be a one off celebration, we received such strong feedback that we hoped to creatively evolve the event for a second year with a host of innovative new performance elements. A vast new project is taking shape at Glastonbury that will lay the foundations for a new site-specific landscape and an evolving show in the sky over the next five years. 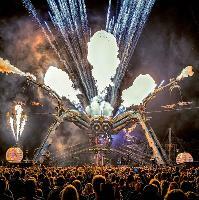 Arcadia’s priority must be to honour the support that Glastonbury have shown over this past decade. Huge thanks to Queen Elizabeth Olympic Park for helping make last year so special – and for being so understanding and supportive this year. We're sorry if we've let anyone down. We have made this decision now to minimise impact. The London festival has ceased to trade and we have spoken with all ticket outlets who will be processing refunds. Please contact the outlet through which you purchased your tickets if you have any specific questions.